What better opportunity to discuss where food comes from, than during lunch time – either before or after eating. There are a lot of important concepts that children should learn over the course of their education – especially early on. Born to eat, children spend a lot of time being fed but how much time learning food sources? In Tofuna Fysh, there are several exciting ingredients including jackfruit, vegan mayo, and seaweed (some may argue that all vegetables are exciting – to include the celery, onions, carrots, and soy protein that combine to make the full list of ingredients :). 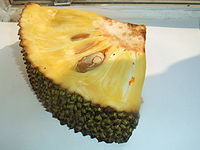 Jackfruit¹ is one of the largest fruits, weighing upwards of 80 pounds, 3 feet long, and almost 2 feet in diameter. Exciting! There is a lot to learn here, many different project-based lessons with a whole range of activities involving this tropical fruit that many Americans don’t get to experience. Making mayo is a chemistry project that’s surprisingly easy and incredibly interesting. By mixing soy milk and oil in a blender, a process called emulsification occurs and the two liquids combine to become much more gelatinous. Emulsify², that’s a cool word that children will definitely want to know more about. Seaweed³ isn’t gross! (I thought it was when I was a kid). It’s actually quite flavorful, comes in many varieties, and can be grown sustainably. A great source of iodine – wait, what’s iodine and why is it important? – seaweed is an interesting plant species. Jackfruit on the tree showing the tree bark. The inflorescences are formed on the trunk, branches or twigs (caulifloria). 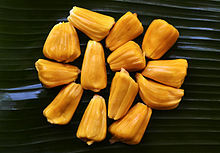 Jackfruit trees are monoecious, that is there are both female and male flowers on a tree. The inflorescences are pedunculated, cylindrical to ellipsoidal or pear-shaped, to about 10-12 centimeters long and 5-7 centimeters wide. Inflorescences are initially completely enveloped in egg-shaped cover sheets which rapidly slough off. 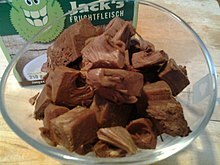 Packaged jackfruit chunks, seasoned with paprika, tomato and other herbs and spices. When prepared in this way, jackfruit has the look and texture of meat. This article is about mixtures of liquids. For the light-sensitive mixture used in photography, see Photographic emulsion. An emulsion is a mixture of two or more liquids that are normally immiscible (unmixable or unblendable). Emulsions are part of a more general class of two-phase systems of matter called colloids. Although the terms colloid and emulsion are sometimes used interchangeably, emulsion should be used when both phases, dispersed and continuous, are liquids. In an emulsion, one liquid (the dispersed phase) is dispersed in the other (the continuous phase). Examples of emulsions include vinaigrettes, homogenized milk, and some cutting fluids for metal working. The word "emulsion" comes from the Latin mulgeo, mulgere "to milk",[specify] as milk is an emulsion of fat and water, along with other components. Two liquids can form different types of emulsions. As an example, oil and water can form, first, an oil-in-water emulsion, wherein the oil is the dispersed phase, and water is the dispersion medium. (Lipoproteins, used by all complex living organisms, are one example of this.) Second, they can form a water-in-oil emulsion, wherein water is the dispersed phase and oil is the external phase. Multiple emulsions are also possible, including a "water-in-oil-in-water" emulsion and an "oil-in-water-in-oil" emulsion. Emulsions, being liquids, do not exhibit a static internal structure. The droplets dispersed in the liquid matrix (called the “dispersion medium”) are usually assumed to be statistically distributed. The term "emulsion" is also used to refer to the photo-sensitive side of photographic film. Such a photographic emulsion consists of silver halide colloidal particles dispersed in a gelatin matrix. Nuclear emulsions are similar to photographic emulsions, except that they are used in particle physics to detect high-energy elementary particles. Fluid system in which liquid droplets are dispersed in a liquid. Note 1: The definition is based on the definition in ref. may exceed the usual size limits for colloidal particles. Note 5: A w/o emulsion is sometimes called an inverse emulsion. the emulsion has properties that are the opposite of those of an emulsion. Its use is, therefore, not recommended. Emulsions contain both a dispersed and a continuous phase, with the boundary between the phases called the "interface". Emulsions tend to have a cloudy appearance because the many phase interfaces scatter light as it passes through the emulsion. Emulsions appear white when all light is scattered equally. If the emulsion is dilute enough, higher-frequency (low-wavelength) light will be scattered more, and the emulsion will appear bluer – this is called the "Tyndall effect".If the emulsion is concentrated enough, the color will be distorted toward comparatively longer wavelengths, and will appear more yellow. This phenomenon is easily observable when comparing skimmed milk, which contains little fat, to cream, which contains a much higher concentration of milk fat. One example would be a mixture of water and oil. Two special classes of emulsions – microemulsions and nanoemulsions, with droplet sizes below 100 nm – appear translucent. This property is due to the fact that light waves are scattered by the droplets only if their sizes exceed about one-quarter of the wavelength of the incident light. Since the visible spectrum of light is composed of wavelengths between 390 and 750 nanometers (nm), if the droplet sizes in the emulsion are below about 100 nm, the light can penetrate through the emulsion without being scattered. Due to their similarity in appearance, translucent nanoemulsions and microemulsions are frequently confused. Unlike translucent nanoemulsions, which require specialized equipment to be produced, microemulsions are spontaneously formed by “solubilizing” oil molecules with a mixture of surfactants, co-surfactants, and co-solvents. The required surfactant concentration in a microemulsion is, however, several times higher than that in a translucent nanoemulsion, and significantly exceeds the concentration of the dispersed phase. Because of many undesirable side-effects caused by surfactants, their presence is disadvantageous or prohibitive in many applications. In addition, the stability of a microemulsion is often easily compromised by dilution, by heating, or by changing pH levels. Common emulsions are inherently unstable and, thus, do not tend to form spontaneously. Energy input – through shaking, stirring, homogenizing, or exposure to power ultrasound – is needed to form an emulsion. Over time, emulsions tend to revert to the stable state of the phases comprising the emulsion. An example of this is seen in the separation of the oil and vinegar components of vinaigrette, an unstable emulsion that will quickly separate unless shaken almost continuously. There are important exceptions to this rule – microemulsions are thermodynamically stable, while translucent nanoemulsions are kinetically stable. Whether an emulsion of oil and water turns into a "water-in-oil" emulsion or an "oil-in-water" emulsion depends on the volume fraction of both phases and the type of emulsifier (surfactant) (see Emulsifier, below) present. In general, the Bancroft rule applies. Emulsifiers and emulsifying particles tend to promote dispersion of the phase in which they do not dissolve very well. For example, proteins dissolve better in water than in oil, and so tend to form oil-in-water emulsions (that is, they promote the dispersion of oil droplets throughout a continuous phase of water). The geometric structure of an emulsion mixture of two lyophobic liquids with a large concentration of the secondary component is fractal: Emulsion particles unavoidably form dynamic inhomogeneous structures on small length scale. The geometry of these structures is fractal. The size of elementary irregularities is governed by a universal function which depends on the volume content of the components. The fractal dimension of these irregularities is 2.5. Emulsion stability refers to the ability of an emulsion to resist change in its properties over time. There are four types of instability in emulsions: flocculation, creaming/sedimentation, coalescence, and Ostwald ripening. Flocculation occurs when there is an attractive force between the droplets, so they form flocs, like bunches of grapes. Coalescence occurs when droplets bump into each other and combine to form a larger droplet, so the average droplet size increases over time. Emulsions can also undergo creaming, where the droplets rise to the top of the emulsion under the influence of buoyancy, or under the influence of the centripetal force induced when a centrifuge is used. Creaming is a common phenomenon in dairy and non-dairy beverages (i.e. milk, coffee milk, almond milk, soy milk) and usually does not change the droplet size. Sedimentation is the opposite phenomenon of creaming and normally observed in water-in-oil emulsions. Sedimentation happens when the dispersed phase is denser than the continuous phase and the gravitational forces pull the denser globules towards the bottom of the emulsion. Similar to creaming, sedimentation follows Stoke’s law. An appropriate "surface active agent" (or "surfactant") can increase the kinetic stability of an emulsion so that the size of the droplets does not change significantly with time. It is then said to be stable. For example, oil-in-water emulsions containing mono- and diglycerides and milk protein as surfactant showed that stable oil droplet size over 28 days storage at 25°C. The stability of emulsions can be characterized using techniques such as light scattering, focused beam reflectance measurement, centrifugation, and rheology. Each method has advantages and disadvantages. The kinetic process of destabilization can be rather long – up to several months, or even years for some products. Often the formulator must accelerate this process in order to test products in a reasonable time during product design. Thermal methods are the most commonly used – these consist of increasing the emulsion temperature to accelerate destabilization (if below critical temperatures for phase inversion or chemical degradation). Temperature affects not only the viscosity but also the inter-facial tension in the case of non-ionic surfactants or, on a broader scope, interactions of forces inside the system. Storing an emulsion at high temperatures enables the simulation of realistic conditions for a product (e.g., a tube of sunscreen emulsion in a car in the summer heat), but also to accelerate destabilization processes up to 200 times. Mechanical methods of acceleration, including vibration, centrifugation, and agitation, can also be used. These methods are almost always empirical, without a sound scientific basis. Egg yolk – in which the main emulsifying agent is lecithin. In fact, lecithos is the Greek word for egg yolk. Detergents are another class of surfactant, and will interact physically with both oil and water, thus stabilizing the interface between the oil and water droplets in suspension. This principle is exploited in soap, to remove grease for the purpose of cleaning. Many different emulsifiers are used in pharmacy to prepare emulsions such as creams and lotions. Common examples include emulsifying wax, polysorbate 20, and ceteareth 20. Sometimes the inner phase itself can act as an emulsifier, and the result is a nanoemulsion, where the inner state disperses into "nano-size" droplets within the outer phase. A well-known example of this phenomenon, the "Ouzo effect", happens when water is poured into a strong alcoholic anise-based beverage, such as ouzo, pastis, absinthe, arak, or raki. The anisolic compounds, which are soluble in ethanol, then form nano-size droplets and emulsify within the water. The resulting color of the drink is opaque and milky white. Other foods can be turned into products similar to emulsions, for example meat emulsion is a suspension of meat in liquid that is similar to true emulsions. In pharmaceutics, hairstyling, personal hygiene, and cosmetics, emulsions are frequently used. These are usually oil and water emulsions but dispersed, and which is continuous depends in many cases on the pharmaceutical formulation. These emulsions may be called creams, ointments, liniments (balms), pastes, films, or liquids, depending mostly on their oil-to-water ratios, other additives, and their intended route of administration. The first 5 are topical dosage forms, and may be used on the surface of the skin, transdermally, ophthalmically, rectally, or vaginally. A highly liquid emulsion may also be used orally, or may be injected in some cases. Microemulsions are used to deliver vaccines and kill microbes. Typical emulsions used in these techniques are nanoemulsions of soybean oil, with particles that are 400–600 nm in diameter. The process is not chemical, as with other types of antimicrobial treatments, but mechanical. The smaller the droplet the greater the surface tension and thus the greater the force required to merge with other lipids. The oil is emulsified with detergents using a high-shear mixer to stabilize the emulsion so, when they encounter the lipids in the cell membrane or envelope of bacteria or viruses, they force the lipids to merge with themselves. On a mass scale, in effect this disintegrates the membrane and kills the pathogen. The soybean oil emulsion does not harm normal human cells, or the cells of most other higher organisms, with the exceptions of sperm cells and blood cells, which are vulnerable to nanoemulsions due to the peculiarities of their membrane structures. For this reason, these nanoemulsions are not currently used intravenously (IV). The most effective application of this type of nanoemulsion is for the disinfection of surfaces. Some types of nanoemulsions have been shown to effectively destroy HIV-1 and tuberculosis pathogens on non-porous surfaces. Emulsifying agents are effective at extinguishing fires on small, thin-layer spills of flammable liquids (class B fires). Such agents encapsulate the fuel in a fuel-water emulsion, thereby trapping the flammable vapors in the water phase. This emulsion is achieved by applying an aqueous surfactant solution to the fuel through a high-pressure nozzle. Emulsifiers are not effective at extinguishing large fires involving bulk/deep liquid fuels, because the amount of emulsifier agent needed for extinguishment is a function of the volume of the fuel, whereas other agents such as aqueous film-forming foam need cover only the surface of the fuel to achieve vapor mitigation. Emulsions are used to manufacture polymer dispersions – polymer production in an emulsion 'phase' has a number of process advantages, including prevention of coagulation of product. Products produced by such polymerisations may be used as the emulsions – products including primary components for glues and paints. Synthetic latexes (rubbers) are also produced by this process. ^ Slomkowski, Stanislaw; Alemán, José V.; Gilbert, Robert G.; Hess, Michael; Horie, Kazuyuki; Jones, Richard G.; Kubisa, Przemyslaw; Meisel, Ingrid; Mormann, Werner; Penczek, Stanisław; Stepto, Robert F. T. (2011). "Terminology of polymers and polymerization processes in dispersed systems (IUPAC Recommendations 2011)". Pure and Applied Chemistry. 83 (12): 2229–2259. doi:10.1351/PAC-REC-10-06-03. ^ a b c Mason TG, Wilking JN, Meleson K, Chang CB, Graves SM (2006). "Nanoemulsions: Formation, structure, and physical properties" (PDF). Journal of Physics: Condensed Matter. 18 (41): R635–R666. Bibcode:2006JPCM...18R.635M. doi:10.1088/0953-8984/18/41/R01. ^ Leong TS, Wooster TJ, Kentish SE, Ashokkumar M (2009). "Minimising oil droplet size using ultrasonic emulsification". Ultrasonics Sonochemistry. 16 (6): 721–7. doi:10.1016/j.ultsonch.2009.02.008. PMID 19321375. ^ Kentish, S.; Wooster, T.J.; Ashokkumar, M.; Balachandran, S.; Mawson, R.; Simons, L. (2008). "The use of ultrasonics for nanoemulsion preparation". Innovative Food Science & Emerging Technologies. 9 (2): 170–175. doi:10.1016/j.ifset.2007.07.005. ^ Ozhovan M.I. (1993). "Dynamic uniform fractals in emulsions" (PDF). J. Exp. Theor. Phys. 77 (6): 939–943. Bibcode:1993JETP...77..939O. ^ a b McClements, David Julian (16 December 2004). Food Emulsions: Principles, Practices, and Techniques, Second Edition. Taylor & Francis. pp. 269–. ISBN 978-0-8493-2023-1. ^ Silvestre, M.P.C. ; Decker, E.A. ; McClements, D.J. (1999). "Influence of copper on the stability of whey protein stabilized emulsions". Food Hydrocolloids. 13 (5): 419. doi:10.1016/S0268-005X(99)00027-2. ^ a b Loi, Chia Chun; Eyres, Graham T.; Birch, E. John (2019). "Effect of mono- and diglycerides on physical properties and stability of a protein-stabilised oil-in-water emulsion". Journal of Food Engineering. 240: 56–64. doi:10.1016/j.jfoodeng.2018.07.016. ISSN 0260-8774. ^ Elizabeth Green (2018-10-01). "Simple Cellulose: Renmatix Expands Hydrolysis Technologies". FoodIngredientsFirst.com. FoodIngredientsFirst.com. ^ Anne-Marie Faiola (2008-05-21). "Using Emulsifying Wax". TeachSoap.com. TeachSoap.com. Retrieved 2008-07-22. ^ a b Aulton, Michael E., ed. (2007). Aulton's Pharmaceutics: The Design and Manufacture of Medicines (3rd ed.). Churchill Livingstone. pp. 92–97, 384, 390–405, 566–69, 573–74, 589–96, 609–10, 611. ISBN 978-0-443-10108-3. ^ Troy, David A.; Remington, Joseph P.; Beringer, Paul (2006). Remington: The Science and Practice of Pharmacy (21st ed.). Philadelphia: Lippincott Williams & Wilkins. pp. 325–336, 886–87. ISBN 978-0-7817-4673-1. ^ "Adjuvant Vaccine Development". Archived from the original on 2008-07-05. Retrieved 2008-07-23. ^ "Nanoemulsion vaccines show increasing promise". Eurekalert! Public News List. University of Michigan Health System. 2008-02-26. Retrieved 2008-07-22. ^ Friedman, Raymond (1998). Principles of Fire Protection Chemistry and Physics. Jones & Bartlett Learning. ISBN 978-0-87765-440-7. Look up emulsion in Wiktionary, the free dictionary. Edible seaweed, or sea vegetables, are seaweeds that can be eaten and used in the preparation of food. They typically contain high amounts of fiber. They may belong to one of several groups of multicellular algae: the red algae, green algae, and brown algae. Seaweeds are also harvested or cultivated for the extraction of polysaccharides  such as alginate, agar and carrageenan, gelatinous substances collectively known as hydrocolloids or phycocolloids. Hydrocolloids have attained commercial significance, especially in food production as food additives. The food industry exploits the gelling, water-retention, emulsifying and other physical properties of these hydrocolloids. Most edible seaweeds are marine algae whereas most freshwater algae are toxic. Some marine algae contain acids that irritate the digestion canal, while some others can have a laxative and electrolyte-balancing effect. Most marine macroalgae are nontoxic in normal quantities, but members of the genus Lyngbya are potentially lethal. Typically poisoning is caused by eating fish which have fed on Lyngbya or on other fish which have done so. This is called ciguatura poisoning. Handling Lyngbya majuscula can also cause seaweed dermatitis. Some species of Desmarestia are highly acidic, with vacuoles of sulfuric acid that can cause severe gastrointestinal problems. Seaweeds are used extensively as food in coastal cuisines around the world. Seaweed has been a part of diets in China, Japan, and Korea since prehistoric times. Seaweed is also consumed in many traditional European societies, in Iceland and western Norway, the Atlantic coast of France, northern and western Ireland, Wales and some coastal parts of South West England, as well as New Brunswick, Nova Scotia, and Newfoundland and Labrador. The Māori people of New Zealand traditionally used a few species of red and green seaweed. Seaweed contains high levels of iodine relative to other foods. In the Philippines, Tiwi, Albay residents created a new pancit or noodles made from seaweed, which can be cooked into pancit canton, pancit luglug, spaghetti or carbonara and is claimed to have health benefitssuch as being rich in calcium, magnesium and iodine. One study in 2014 pointed to certain species of seaweed as being a possible vegan source of biologically-active Vitamin B12. The study noted that B-12 was found in both raw and roasted seaweed, the latter containing about half as much—but still a sufficient amount. A mere 4 grams of dried purple laver is considered sufficient to meet the RDA for B-12. Polysaccharides in seaweed may be metabolized in humans through the action of bacterial gut enzymes. Such enzymes are frequently produced in Japanese population due to their consumption of seaweeds. In some parts of Asia, nori 海苔 (in Japan), zicai 紫菜 (in China), and gim 김 (in Korea), sheets of the dried red alga Porphyra are used in soups or to wrap sushi or onigiri. Chondrus crispus (commonly known as Irish moss) is another red alga used in producing various food additives, along with Kappaphycus and various gigartinoid seaweeds. Japanese cuisine has seven types of seaweed identified by name, and thus the term for seaweed in Japanese is used primarily in scientific applications, and not in reference to food. Seaweed oil, also called Algae oil, is used for making food. Seaweed oil is also used as a source of fatty acid dietary supplement, as it contains mono- and polyunsaturated fats, in particular EPA and DHA, both of them Omega-3 fatty acids . Its DHA content is roughly equivalent to that of salmon based fish oil. Seaweed oil is also used for biofuel, massage oil, soaps, and lotions. ^ K.H. Wong, Peter C.K. Cheung (2000). "Nutritional evaluation of some subtropical red and green seaweeds: Part I — proximate composition, amino acid profiles and some physico-chemical properties". Food Chemistry. 71 (4): 475–482. doi:10.1016/S0308-8146(00)00175-8. ^ Garcia-Vaquero, M; Rajauria, G; O'Doherty, J.V; Sweeney, T (2017-09-01). "Polysaccharides from macroalgae: Recent advances, innovative technologies and challenges in extraction and purification". Food Research International. 99 (Pt 3): 1011–1020. doi:10.1016/j.foodres.2016.11.016. hdl:10197/8191. ISSN 0963-9969. PMID 28865611. ^ Garcia-Vaquero, M; Lopez-Alonso, M; Hayes, M (2017-09-01). "Assessment of the functional properties of protein extracted from the brown seaweed Himanthalia elongata (Linnaeus) S. F. Gray". Food Research International. 99 (Pt 3): 971–978. doi:10.1016/j.foodres.2016.06.023. hdl:10197/8228. ISSN 0963-9969. PMID 28865623. ^ a b c d Turner, Nancy J.; von Aderkas, Patrick (2009). "3: Poisonous Plants of Wild Areas". The North American Guide to Common Poisonous Plants and Mushrooms. Portland, OR: Timber Press. pp. 115–6. ISBN 9780881929294. OCLC 747112294. ^ Hom, Ken (2012). "Crisp Seeweed". Good Food Channel. UK TV.CO.UK. Retrieved 16 October 2014. ^ "Kai Recipe's used by Kawhia Maori & Early Pioneers". Kawhia.maori.nz. Retrieved 2011-11-11. ^ "Micronutrient Information Center: Iodine". Oregon State University: Linus Pauling Institute. 2014-04-23. Retrieved 2011-11-11. ^ "Albay folk promote seaweed 'pansit'". ABS-CBN Regional Network Group. 2008-04-08. Retrieved 2009-08-04. ^ Hehemann, Jan-Hendrik; Correc, Gaëlle; Barbeyron, Tristan; Helbert, William; Czjzek, Mirjam; Michel, Gurvan (8 April 2010). "Transfer of carbohydrate-active enzymes from marine bacteria to Japanese gut microbiota". Nature. 464 (7290): 908–912. Bibcode:2010Natur.464..908H. doi:10.1038/nature08937. PMID 20376150. ^ Dawes, Clinton J. (1998). Marine botany. New York: John Wiley. ISBN 978-0-471-19208-4. ^ Harrison, M. (2008). "Edible Seaweeds around the British Isles". Wild Food School. Retrieved 2011-11-11. Wikimedia Commons has media related to Edible seaweed.